Many of you have made it through the first week of school getting the kids back on a sleeping schedule and finding your own new groove. CONGRATS! The transition to Fall is always a bit wonky which can take a toll on our confidence. The lazy days of Summer are over and it’s time to get focused. You spent so much time on your family and making sure their Summer was memorable and now it’s time to nurture yourself a bit. What activities do you want to participate in? You’ve filled up your kids after school schedules, but what about YOU? Do you want to try a new workout program? Start a side business? Join a book club? Take an online class? all of which will build your confidence. Are you the type who thinks and talks about doing something, but you never get around to it? This actually wreaks havoc on your confidence! Do you notice that sense of disappointment in yourself when you shrink back or are just plain lazy? I challenge you TODAY — on the first of the month to step into the new season with new habits. 1)RECALL A TIME YOU WERE CONFIDENT & POWERFUL: Remember that time you nailed that important business presentation or told a great joke during a speech that had the room in stitches or threw a perfect dinner party from the appetizer all the way to the after dinner coffee? Recalling these moments when you were proud of yourself actually triggers you to feel that feeling of confidence again. Often, we tend to focus on our shortcomings and losses instead of our wins. Every once in a while, I take a look over my resume and credentials to remind myself that I’m not doing so bad. ACTION STEP: Make it a regular habit of taking time to focus on your accomplishments. 2)TRY SOMETHING NEW (even if it scares you): We are creatures of habit and my intention with this post today is to encourage a change in the bad habits that are holding you back. I set a goal for 2014 to book a minimum of three speaking engagements. Recently, I hit my goal. Woop! I didn’t tell anyone about the first two. They were at smaller venues and I considered it practice and no one would know if I completely bombed. I’ve spoken many times in public, but it still makes me a ball of nerves. It’s something I want to get better at. I have the ability to talk into the camera all day long with no problem. That’s where I feel “at home”. Recently, I spoke at a bigger event and thought I was going to puke. I didn’t. Stepping out of my comfort zone and doing something that scared me strengthened my confidence in a major way. ACTION STEP: Set the goal. What is that thing you’ve wanted to do even if it terrified you? Build your confidence by setting the goal and completing it. 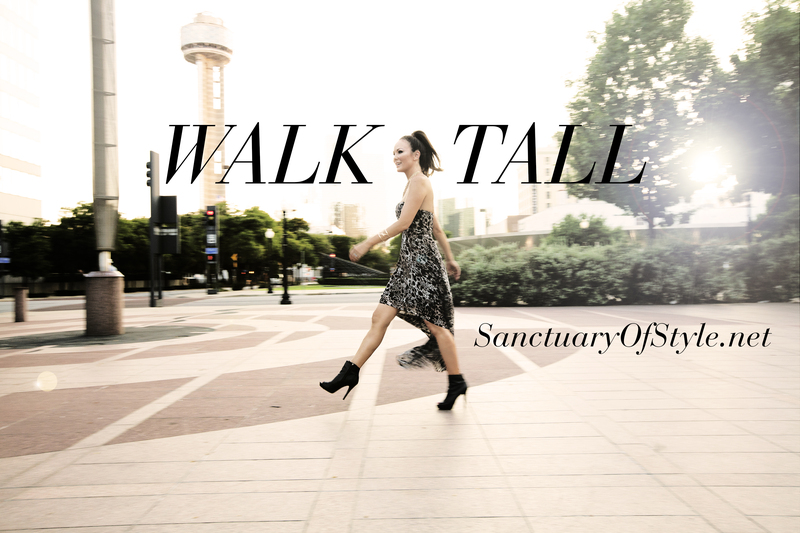 3)WALK TALL: If you’ve been part of SOS for the past year or so, you’ve seen me say this in many videos and on the blog. Why did I start this? I began noticing my own terrible posture when I was out and about in public. On those days I felt “schleppy”, my shoulders would round forward and my eyeline was toward the ground. As I looked around, many women were doing the same thing. Their energy was “stand offish” instead of magnetic. So was mine! What the heck? It broke my heart to see so many women with such low self-confidence. I had to have a chat with myself as well. Sometimes it’s good to take yourself to the mirror and talk to yourself as if you were your BFF. We encourage our friends all the time and I want you to do that for yourself today. Being the researcher I am, I found this to be scientifically backed in a study by Scientific America. ACTION STEP: Focus on your posture. Stand tall, core tight, eyeline forward and shoulders back. Standing tall actually signals the body and mind to feel more powerful. Like my Grandma always said, “it’s time to S*@! or get off the pot”! Don’t you just love Southern sayings? The new season is the perfect time to try some new things. What will you step out and walk tall doing? Please share this post with any friends who need the nudge. Perhaps, do this with a friend and create some accountability. If you need more in-depth assistance, I have limited space for new private clients in September. Receive a complimentary 15 minute consultation via Skype to discuss your options. Serious inquiries only. Contact me here. 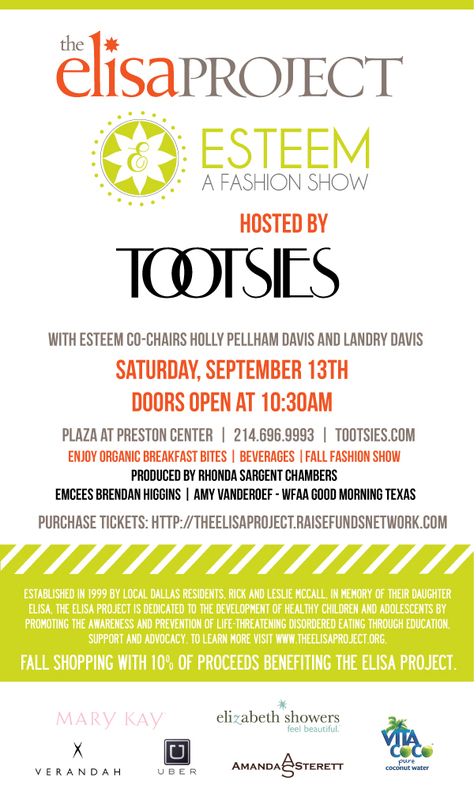 If you’re in the DFW area, please join us on September 12th for the ESTEEM 2105 Fashion Show benefitting The Elisa Project. I’m honored to walk in this show again and I do so proudly for the teenage girls I have mentored with eating disorders. I also battled poor body image as a teen model and want to empower the next generation with the knowledge and education that I was not given when I was young. This entry was posted in Charity Events, Confidence Building, Fall Style and tagged Confidence Building, Esteem Fashion Show, Fall, September Goals, The Elisa Project, Tiffany Hendra, Tootsies. Bookmark the permalink. ← 5 Fall Styles You Can Wear NOW!